It was a different kind of a gig from the usual intimate affair with Luka - with the lights fully on, and the cameras rolling, we, the audience were just a little unsure as to how we should behave. But it didn't take long before Luka made us feel at home. Opening with his peace anthem 'I am not at War with anyone' he proceeded to take us on a fabulous journey of songs old, new, borrowed and blue. Classics like Lonesome Robin, Gone to Pablo, City of Chicago, and Diamond Mountain sat nicely alongside songs from 'Innocence'. June, Gypsy Music, Primavera, and No matter where you go (a particular favourite of mine) were met with a rapturous reception, from an audience - that for once could be seen. And what a great audience we were too! From all over the world we came to see this incredible - yet understated talent, a man who actively encourages us all to be part of his performance. 'Sunny Sailor Boy' sounded particularly good as did the fantastic 'Don't be afraid of the light that shines within you'. Luka and his guitar seamlessly shift from the rhythmic and rousing, to the gently poetic. The truly beautiful 'Thank You for Bringing Me Here', and the emotive 'The Man is Alive' were sung with great passion by an artist who doesn't give half measures. After a couple of re-takes due to technical reasons (which of course we didn't mind at all) Luka treated us to 'The Joy of Living' - a magnificent song by the late Ewan MacColl. The night ended with a question and answer session, where we learned a bit more about this enigma. Ireland is his most inspirational work place. 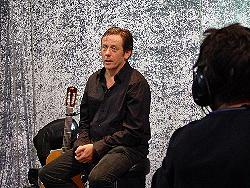 The name Luka Bloom is like a mask he hides behind - but one that enables him to be true to himself. His bout of tendonitis meant he had to rethink the way he worked, and to some degree reinvent himself - he doesn't play 'Delirious' anymore because it's a killer. He doesn't believe he is a political singer. Age is immaterial - he lives 'Here and Now'. As I made my way back to my Dublin b+b I pondered what it is about Luka that seems to reach people. Apart from the obvious (lyrics, guitar playing and voice) I think it is the combination of this fabulous talent with his great humility and humour that make Luka someone special to everyone. I look forward to the DVD release. On Monday morning, 15 August I read an e-mail send by the Luka Team. It was an invitation to witness Luka record a live DVD in Dublin. I knew this was my chance to be part of something very special. Tickets were sold through the Luka web site and were available for only 100 fans. My husband and I were two of those happy few. And something special it was. We, the audience, were packed into a very hot and steamy studio, together with Luka and his crew. For us and Luka it was strange to experience a show with all the lights on. And the lights made sure that the temperature even got higher! From the moment Luka entered the studio and started to play I am not at War the atmosphere was magical. It was very obvious that the man was so excited about what was going on: he actually was recording his live DVD and the crowd loved him! They came from all over the world, just to watch him play. The hundred Luka-crazy people in the studio sang along with almost every line. Luka played a long set of both old and new songs. The oldest is Lonesome Robin, the song he learned to play in what he called his 'summer of love' in 1973 (forgive me if I have the wrong year). Singing along with Sunny Sailor Boy the crowd sounded like a thousand people audience. And at the very end of the evening, long after recording stopped, there was an awesome silence in the audience when Luka played The Joy of Living (by Ewan MacColl). With this beautiful song, which he promised to record in the future, he said goodbye. I am a Luka fan since 1991. In a record shop I heard 'You couldn't have come...' This song made me buy the Riverside album immediately. The next day Luka played the Pinkpop festival. That was the first time I saw him live on stage. I have been a fan ever since. During the 14 years I saw a lot of performances, in all parts of the Netherlands (I live in the North, so I need to travel for all the gigs). But the Helix-experience has been the best so far. Can't wait to see the result! The Priest of Love. Does he see himself thus? Uniting the multi-cultural audience. We, delighting in it; he, knowing we do. Opening song: I Am Not at War With Anyone. And beautifully sung. One small lyrical change: "this rush to war was wrong". TeamLuka at reception: Anne and Clare. Niall wearing many hats and very busy. Anne seats the audience, brings them into the arena, small groups at a time. She knows where she wants to seat people. Later in the evening, I am amazed at the grouping. We are forewarned: go to the bathroom now, as no one will be allowed out once taping has begun. Also stated: it will be warm in there! Before the gig: people standing in the lobby. Some in groups. Many alone. I stand and look at individuals and think of the magic man that has pulled them in. The preacher, who at once speaks to his entire congregation individually. Upon leaving, each one feels the message has been spoken solely for them. So, I look at the individuals leaning against the lobby walls, waiting for Luka, and I try to imagine that they feel the same way I do about this incredible man. He is less the entertainer tonight, more the giver. The songs are not technically or faux polished, but come from a big heart. This is not to say they were under or even overly rehearsed. They were simply small sermons of divine perfection, and perfect divinity. He is giving to the audience, but as well to the next audience (the viewers of the DVD). He looks at the camera. He gives 'the look'. You know when you have been given 'the look'! You, quite frankly, don't know where to look, but you do not under any circumstances want to break that gaze! If you are lucky enough to have deposited upon your eyes that startlingly frank, blue penetrating gaze, you know you are engaged in 'the no-blink game'. Yikes! Also, people around you know you have received the look - are they jealous or relieved? Here's the good, good news. He gave the look to the camera on at least two, if not more occasions. So, lucky TV audience! Now you have several months to save for and purchase a wide, flat screen HDTV! Let me begin my review by firstly saying, the gig was over a week ago now and if my memory of songs is in the wrong order I hope you can forgive me. So anyway. This was my first Luka gig. I had seen him previously when he played with Christy in the Kaedeen and since then I have been an avid fan. As has been mentioned before, we arrived at The Helix and were ushered in to The Space, a small, hot and sweaty room, perfect for a shockingly intimate gig. Luka graced the stage letting us know he was "Happy as a pig in s**t!" and the ensuing laughter set the hugely informal tone that would prevail for the evening. It was like Luka jamming in your sitting room! As far as my mind allows me to remember Luka kicked the night off with "I Am Not At War With Anyone" which got us singing early on and was a lovely kick-start. A new tune was quite welcome too. The night kept going, with the highlights for me anyway being "Lonesome Robin", "Sunny Sailor Boy", "Innocence" and "Love Is A Place I Dream Of" though of course, no song felt off or bad, these were just the ones that really struck a chord with me. Drawing near to the end of the main set, sweat building on us and Luka, we got "City Of Chicago" among others and the feeling in the air was, as Luka reminded us, sure we're only getting started. When Luka left the stage he received a standing ovation, which seemed to go on for hours, nothing I have ever seen before in my life! By the time he came back out my hands were numb! It was in this encore we got something very special. "Exploring the Blue" was delivered with great skill and I must say it was one of my favourites. 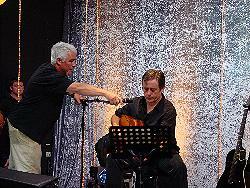 The encore songs were all crowd favourites but the hushed, awed moment came when Luka sang "The Man Is Alive". The hair did more than stand up on my neck, it almost left altogether. Luka connected so strongly with the music and it showed so strongly too. This was also my first time hearing this song and I dare anyone to watch this performance when the DVD comes about and not feel the lump form in his or her throat. It was a beautiful night and the Q&A session served to reinforce the informal feel to it all. A supreme musician delivering a marvellous show. comes the music of the inner universe". So true, the night spent with Luka Bloom at the Helix did just that! An intimate gig consisting of 100 lucky fans, the Luka team and of course the man himself, most pure Oakleaf (For those unfamiliar with the meaning of Kildare, 'Cill Dara' means 'The church of the Oak Tree') and Luka Bloom is our most sublime apostle. The night began with an atmosphere full of expectation and anticipation and boy we were not disappointed. It was strange at first everyone intrigued by the setting, then when we were told that it was going to be this bright a wave of panic floated through the audience and you could sense people's uncertainty. During the first song I watched the people, everyone looked a little self conscious, wishing the lights would disappear and, I guess, Luka must have sensed it also and 'fair play' he acknowledged the weirdness of being able to see us all, we laughed and calm was restored. From that moment the night took off anew ... we grooved, sang, tapped, swayed, nodded to the rhythm and soaked up the marvel unfolding. As Luka got more and more into it, he brought the audience along and we embarked on a fantastic journey of music and song that reached deep into the soul and shimmered with insight capturing a spontaneous physical, emotional and spiritual response inside us all, very special. Locked in, we peddled on through and as he performed 'Rainbow day' and 'Sunny Sailor Boy' the energy within the room drifted to a higher plane as we all sang in unison. Even now as I listen to these songs I am transported back in time to the helix, all senses firing - just fabulous. Every song sung had its moment in the spot light (literally), every word treasured and wrist movement captivating - all the usual suspects hit a chord, 'Thank you for bringing me here', 'Here and Now', ' Primavera', 'Peace on Earth', 'In the city of Chicago', 'June', 'No matter where you go, there you are' and of course 'The Man Is Alive'. Boy oh boy does he know how to generate heat and energy. Every song has its own message, a driving catalyst to inspire the senses, all that's required is the courage to allow his message inspire you and embrace the outcome. 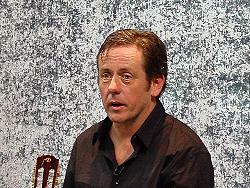 For those out there yet to discover the phenomena that is Luka Bloom he brings lavender to calm. His gigs are powerful, his message simple, your drawn in by the rhythm and the words then catapulted out somehow changed, reborn. Our finest Lily. Experience his gigs for yourself and draw your own conclusion. The question and answer session at the end of the night was a pleasant surprise, a bonus on top of an already amazing night. We got a little insight into the man behind the mask and the mask of the man. 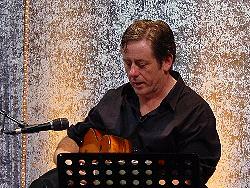 To summarize, Luka Bloom (the mask) was invented to enable the man to be true, it provides a stage for him to get his message out there. He talked of his tendonitis, which has followed him throughout his career and how he is unable to play some of his older songs as a result, 'Delirious' being one. He talked of reinventing himself to overcome the tendonitis problem and lucky for us he did. Positive thinking and living in the present are paramount. When asked whether he saw himself as a political writer, we got a slight glimpse of the man, a little annoyed by the suggestion, and 'no' definitely not political or maybe political with a small p. His inspiration is life. You can cast aside many things in the journey through life but one of the things worth holding onto is your 'Innocence'. He ended the night with a little acoustic number 'The Joy of Living', the last song ever written by Ewan MacColl... Beautiful. When I told a close friend about the gig at the helix her response summed it up completely ...SPOILT ....you were just spoilt. How right she is. Spoilt, spoilt and spoilt. Dublin is cold and moist, and crowded and very cosmopolitan but whatever, I am in Ireland and I love it. Have been wandering around since I got in on Tuesday - have you ever seen the oldest neon sign in Dublin? I have! Once inside the Helix, I found the Lukalisters. After a bit of waiting about and catching up, we were led into a tiny, tiny little room called the Space. And it's a bit of an ironic name considering that there's hardly any space in it at all! There were loads of lights and camera equipment taking up all the room that wasn't occupied by an arse, and over the course of the evening it became very, very hot in there. As Luka said, "I'm hoping by the end of the night we'll all be in our underwear." It got a bit better when we were given a little break and some water. But oh, it was all worth it. What a show. Songs I'd never heard before, new songs, old songs, and that great Luka vibe in a room of just over one hundred people. He really put on a fantastic performance, and the best bit is that now everyone is going to get to see it! The thing I've always thought about Luka Bloom is that you can like his albums, and most people who hear them do, but the moment that he really catches hold of you is when you see him live. A DVD isn't the same as a live show, but it's the next best thing - especially if he doesn't tour your country for a long while! And this was interesting, seeing it all being filmed because it's not normal to have all the lights on the whole time, and he had to do a few songs twice because of technical glitches with the crew (and not anything with Luka, of course - heavens no). It was a great vibe though, a good crowd that sang along loudly to everything, and cheered and asked very good questions in the Q&A after. The audience was a bit like a UN summit; I heard about five different languages in the lobby! And I'm not going to say anything about what he talked about before songs and whatnot because you're going to have to buy the DVD for all that! Luka was really very excited about the whole thing, and he was very talky and cheerful, and really impressed with the singing we did. During 'Love Is a Place' everyone sang along very softly like a little choir of angels, and then again for 'Thank You For Bringing Me Here'. It was very beautiful. It was very cool how much everyone sang along to everything - especially 'Lonesome Robin'! All in all, it was a brilliant night that was worth the flight and the jet lag. Absolutely worth it. Everyone was lovely and a big thanks to Niall and Anne for looking after the American girls. After thinking about the show I have to say that the best feature of the evening was the enthusiasm of everyone involved - from the fans to the crew to Team Luka to Himself. The atmosphere took an uncomfortable setup (small, too-hot space, bright lights, equipment) and made it into something remarkable. Luka was really quite pleased with the group assembled, and he made the best of what had to be a very odd and difficult situation. It was as good as any show I've seen in a proper venue, without the lights, cameras, action! all over the place. It reminded me of warm nights in McGann's Boston, or the Tin Angel's long, long room. And for an American girl's first overseas Luka show experience, it was brilliant - and in a few months it'll be forever on DVD, and how cool is that? Another thing I liked was his refusal to sacrifice quality for the sake of the production. He needed a particular light on and so he asked for it. He changed the setlist when the spirit moved him. He talked and told stories, and tuned his guitars the way he wanted to and for however long it took him to get them just right. For such an important evening, the fans and the music still came first and that's always going to set Luka apart from other artists. It's that sort of attitude that makes me proud to be a fan. I and my girlfriend Niamh had been looking forward to seeing Luka Bloom live again after our debut Luka gig back in February in Vicar Street. Since that first gig we had registered on his website for all the latest news and bought the entire back catalogue. So it was brilliant to be two of the lucky 100 or so, who had got tickets for the gig at which Luka would be filming a DVD, at an intimate venue called the Space at the Helix in Dublin. It was only as the gig got closer that you began to realise that this gig would be a little stranger than the norm. The expectation I had as I queued to enter the arena was that two or three guys would be wandering around with video cameras and microphones recording the one man wall of guitar sound that is Luka Bloom. The reality was much different, there seemed a bigger production crew than an audience. The Space is a very intimate venue akin to a warm and cosy local parish hall. We were directed in groups of 4/6 at a time to our seats, which made us a little apprehensive from the off, with the director making a few adjustments here and there, which in effect was only moving a few people to more suitable seats to avoid viewing restriction by the mass of equipment. That was the last direction that the audience required during the night. No member of the audience would have been more than five metres from the stage. We were told the lights would be left on during the performance, an experience new both to the audience and Luka, who would have to perform to the whites of our eyes for a change. So we were set for what was to me a very strange music gig. Then entered Luka, to a most rapturous applause, which gave the impression of a far larger audience, than was actually present. He set us up for the night as if it was necessary, by mentioning that "tonight was a one off, it wasn't like one if those rock star DVD's that would be filmed over 5/6 nights, the Luka Bloom team had no shagging money for that type of carry, on so this was it". During the first song I felt a little uncomfortable as I felt the glare of a camera catch my eye and I felt my face turning a very warm red colour. By the end of the song I had forgotten about the camera, the intimacy of the venue, the lights, and the crew. I was back in Vicar Street again with 1500 people having my musical senses blown away once again. By the time Sunny Sailor Boy made its very early entrance in the set list the whole audience was lashing out the chorus over and over and doing a fairly good job of it too. The scene was set for the rest of the gig as Luka performed flawlessly with the aid of a 100 strong backing group whenever it was needed. I attended Vicar Street with no preconceived ideas and left changed by the shear passion of performance, depth of song writing ability, built around a bloody good musical sound. Because let's be honest, some songs are good because of the words and some because of the music, Luka Bloom has a talent for putting these two elements together in equal greatness and wrapping it in an electro acoustic guitar performance that makes the hairs stand on the back on your neck. 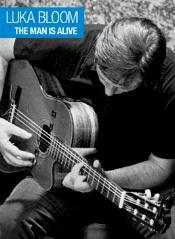 He is to me, the finished article of what live performing singer songwriters are all about. I had preconceived ideas about what I expected at this gig and I wasn't disappointed in any way. In fact Luka will have a hard job to top himself after this gig, a feat I doubt he will have little trouble in achieving. If you haven't seen this guy live yet, I very much advise you to rectify that omission in your musical education the next time an opportunity arises. He is the best thing out there at the minute, or that there has been for a long time in his genre. I have no excuse for having only seen this guy twice and not having bought any of his albums until this year. I am 32 years of age and have lived in Ireland for all but three of those years, I have every album ever issued by Luka's brother Christy, so why is he not the superstar he should be in this country at least if not worldwide. The guy should be on the radio every day of the week over here but he's not. Shock horror he doesn't even have a record deal with a major label. I despair I really do. These thoughts are brought more to bear by the fact the audience on the night were so internationally spread fans having travelled from Holland, USA, Germany, UK, France, Belgium as well as from around Ireland. A profit in his own land seems apt. My personal set list highlights on the night were Fertile Rock, Sunny Sailor Boy, City of Chicago (I'm from Donegal and this song puts a lump in my throat and a tear in my eye every time I hear it sung), Exploring The Blue and my current favourites (from his current album Innocence), June, Innocence, Thank You For Bringing Me Here, No Matter Where You Go, There You Are, which has a message for everyone in Ireland at the minute. The set list also included memorable performances of Gone to Pablo, Diamond Mountain, Primavera, Peace on Earth and Gypsy Music. How good this gig was is easy to explain, we had to be at the venue at 7.15pm. Luka was on just before 8.45pm, close to 11pm after 2 encores he was asked to play 2/3 songs over, for the benefit of the DVD (Lonesome Robin and the fantastic The Man Is Alive). The audience suddenly remembered that a DVD was being filmed, but even after hearing these songs for the second time, it was like the first time around because of the freshness and effort of performance he puts into each track. 11.15pm the organisers are getting worried that we might be flagging under the intense heat of the lights and politely ask if we still wanted to hang around for a Q&A session with Luka, without a moments hesitation 100 voices cry out yes, we are given a five minute break to let our hands recover from the clapping and get some fresh air and liquid on board. To a man and women each audience member is back within the allotted time for the Q&A session. The Q&A session was nearly as good as the performance itself. This guy is genuine, well balanced, honest, funny and down to earth. To be sat beside him on a plane would be no punishment, however I doubt he'd have the same opinion of many of us (thought I rope you all in there rather than just me). Probing questions were asked and each is answered honestly and directly, he'd never make a politician. We learn about the tendonitis he has continually suffered from that affects his ability to play some of the more difficult songs, like Delirious and Acoustic Motorbike, the unbelievable fact that he doesn't have a record company deal, the effect his website and tribute sites have had on his current activities. To finish off nearing midnight he asked us if he could play for us acoustically his current favourite song composed by Ewan MacColl, that he has recently decided to learn after hearing it at a party, The Joy of Living (which is available on the MacColl's double CD 'Antiquities'), suffice to say it was a particular fine rendition of the song by Luka. An absolutely fantastic and unforgettable night was had by all. We left the venue stepped out into a dry Dublin night and even got a taxi within 5 minute, a perfect evening all round. Let the music keep your spirits high. Get into Luka Bloom now, you'll be happier for it. Am a Belgian, living in Cork for the last eight months (currently not planning to move back home). This was definitely not my first Luka Bloom concert. To be honest, think I saw Luka playing more this year alone, than all years before. Can't help it that he's performing so often in Ireland, can I? And what about being back in Belgium for a short visit to my twin sister and her newborn, exactly at the time when he's performing in Brussels. Couldn't skip that one either, could I? The last time I saw him before the Helix gig was in Cobh. Was a magical evening. Just a small room, an audience of about 150 people. It felt like sitting in a living room. With windows on two sides of the room. View on the harbour. Seeing the sunset behind Luka. The sky first turning pink, after that beautiful blue and eventually black. Some great songs, I never heard him perform live before. Lonesome Robin one of them. A new song about the IRA declaration and my all time favourite Exploring the Blue. It was the first time in a while I saw Rudy back on stage. Great surprise. The whole Cobh gig was definitely a foretaste of what Dublin was going to be. Less hot though. I asked my boss that Wednesday to leave a bit earlier from work, to catch the three o'clock train from Mallow to Dublin. Rain was lashing down. Was wearing brand new white sneakers.should know by now that white isn't very suitable for Irish weather conditions. I brought a friend with me to the gig. Since I moved into the house, Luka's music can be heard in nearly all rooms and the kitchen. After taking them to one of his gigs, three of the four housemates call themselves fans as well. I asked Laura, a Canadian girl to go with me. I met here on the train. We were all set for a great evening out. We arrived in Heuston-Station around half five. Time was a bit tight, so we just had a quick bite in the station, before getting on our way to the Helix. Looking on the map, it didn't seem too far away from Marino Institute, the college I had some trainings earlier this year. So we decided to take the 123 bus that direction and walk the rest of the way. We were lucky it was dry by then, 'cause the walk was definitely longer than we expected. First test for my brand new white sneakers.. blisters on both feet indeed. We were in time anyway and Anne and Clare made us feel welcome immediately. There was plenty of time before for a drink. After a quick visit to the bathroom, we were all ready for the real thing. Anne gave us two seats on top of the stand. On the right-hand side. Opposite of the Lukalisters. We had a great view, on both the stage and the audience. Happy enough so.till we later that evening realised we must have gotten one of the hottest seats as well, high in a black corner. Well, it was all worth it. After a short welcoming by Clare, Luka came on stage and the evening started off. I don't remember the set list any more, have never been very well in it. I think it was quite similar to the one in Cobh. But the atmosphere was very different. It was all devoted fans that night in the Helix. Many had travelled a long way to be there that evening. All and everyone of us knew this was a once in a lifetime occasion and we were all definite making the most of it. My housemate and I had been to John Spillane's DVD recording in Cork as well, but comparing the two would be unfair. It was evident that John had to manage with way less resources than Luka. The amount of cameras, lights and people running around that evening in the Helix was a bit overwhelming. Frightening is a bit strong, but still. It took me a while anyway to really get into it. Can imagine it must be pretty nerve wrecking for Luka as well, knowing it all had to happen that very one night. But once again Luka proved to be a professional and after a while we all forgot (almost) about the cameras. The opportunity to sing along came pretty early in the evening and it was obvious straight away this audience was well able for it. Am not a very good singer, so limited myself to miming the songs (on every live DVD there is always one person in the audience just sitting there while all the rest is signing along. me nor my housemate Laura wanted to be that person. therefore the miming). I loved to hear him play Lonesome Robin again. And we were lucky enough to hear some of the songs twice.. Exploring the Blue and The man is Alive two of them. The concert in the Helix was the longest I've ever been to. The most tiring as well. Never knew just sitting, listening and clapping could be so laborious. And hot. People started taking off jumpers, scarves and unnecessary accessories. After a while all sorts of "fans" appeared: tickets, passports, diaries. Guess it made the whole experience even more unique. For the one time we shared Luka's experience on stage, leaving the room for the short break, it looked like all and everyone of us had just given a great stage performance himself. I think it was nearly half eleven before the questions-and-answers-part began. And it was after twelve before I finally found myself a taxi to find some friend's home in Dublin. After searching for the house for almost an hour finally in bed, to get up again (couldn't find the house and forgot to put Lilliane's number in my mobile phone) a couple of hours later to catch the seven o'clock train to be at work in time (or nearly, was half an hour late). Plan was to go to see Roesy in Cyprus Avenue that evening, but was wrecked and opted for an early night instead. Which I still regret. hope to see him another night. We knew as soon as it was announced that we had to be there, that this was going to be a really special night ...... and it was !! Lights, camera, action ..... the heat building with each song. From 'I am not at war with anyone' he played songs old and new. With songs from 30 years ago (Lonesome Robin) to an Ewan MacColl song that he only learned a couple of weeks before, he treated us to some vintage Luka. We had travelled from Scotland, the audience had come from the world over, near and far and we all enjoyed every last minute including a Q & A session at the end. This was as intimate a gig as you could get and it was a real privilege to have been there. Special thanks to Anne and Clare for all their help and to the rest of the Luka team. It will be interesting and exciting to see and hear the finished product and how Brian turns it into a DVD. I'm sure it will be wonderful. Let the Music keep your spirits high !! I first came across Luka about 20 years ago when he was singing in a record shop one lunch time. Later I got to know "The Acoustic Motorbike" and I just never stop liking it - I never saw him sing it live until Vicar Street this year when I almost died! It is the best ever! Even my kids could sing some of it before they could speak! I then found the move to "Before Sleep Comes" a little worrying in that I thought I never hear him play the old stuff again. 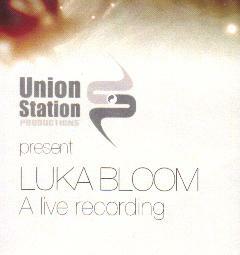 I saw Luka in the Pavilion and another place and then I got the call about the DVD recording and wow. In my mind I guess he had to pick what he liked most as we only had a few hours and he managed a really good blend of old and new, fast and slow, love and war. What he played was fantastic and without doubt the best of a truely talented guy. I got utterly lost in the night. We were lucky to get three tickets, so my wife and I asked a friend who had not seen him before and he was of course thrilled that some tracks had to be played again! That way he has seen Luka twice! And finally myself. Like most people in the audience I had also never been to a concert recording for a DVD before. Really impossible to ignore all the camera equipment and workers in the room, the lights, the (increasing) heat... The audience was only small, but people came from Ireland, England, Scotland, France, Belgium, the Netherlands, the States and we from Germany to be part of this very special and unique event. Sitting there in the small room, full of expectations, waiting for the beginning... if I was feeling a bit uncomfortable and suspicious at first I already forgot about that during the lovely introduction by Clare. She found the right words to announce Luka on stage, to 'break the ice' and make us feel very welcome! When Luka came out the applause he got was overwhelming... and when he finished the first song, I was not thinking anymore of the recording - maybe only from time to time reminded of that by a moving camera in front of us - but most of the time I was only focused on the songs and what he told us between the songs... and all the songs he performed were absolutely stunning! After "I Am Not At War With Anyone" he sang a new song called "Open Up Your Arms" which I had never heard before. Unfortunately I do not remember it very well, because the song which followed then took my whole attention!! Already when he began to tell the wonderful story to the song I knew what would come... "Lonesome Robin", the sad and heart-breaking story about the death of Robin Hood, written by Bob Coltman in 1972. Luka heard and learned it himself in the summer of 1973. In 1977 during an Irish Festival tour in Germany he performed it as a member of Inchiquin and he also recorded it for his first album. So it was one of the first songs he has played in concerts, but in recent years he did sing it so very seldom live that I had not expected to hear it tonight. I loved it!! Definitely this great song did not lose its fascination. "The City of Chicago", "Diamond Mountain", "Love Is A Place I Dream Of", "Here and Now", I have to dream again! "Gypsy Music", ...bring your gypsy music, and we'll be singing along!! ...for sure we did! "No Matter Where You Go, There You Are", "Don't Be Afraid Of The Light That Shines Within You", "Rainbow Day" - forget about the future, squeeze the juice out of the day!! "June" - Ah, I LOVE the way he pulls me in!!! There were so many more brilliant songs, it was simply one highlight after another!! A wonderful mixture of old and new favourites, often and rarely performed songs... And what made this wonderful night so special too was an incredible audience participation to so many songs! To be honest I was a little bit worried if such a small audience - knowing about the recording - would be able to overcome the shyness of singing along to songs... and I was only thinking of songs like "Sunny Sailor Boy"... but there was absolutely no need to worry! Also to songs I have never heard anyone joining in before, here they did!! And it sounded very lovely and never too much, as if we had practised it before! But for sure we didn't, it just happened!!! And if that all was not enough, the very best came at the end, when I recognized that the next song he would sing would be "The Man Is Alive"!!! A very special and favourite song of mine! And though I have seen him quite often live I have heard him singing it in concerts very, very seldom! It was the first song I had ever heard by him, the song which made me go to my first concert, made me looking for more... maybe without this wonderful song I would not have been here tonight. Well, what happens when the heart just stops... :-) and thanks to some technical problems during the recording we got to hear it twice!! The concert ended with a standing ovation and a rapturous applause!! After a short break and some water Luka came back for a question and answer session, finally closing the event with a very beautiful song he has just learned a short while ago, Ewan MacColl's "The Joy of Living". It was the perfect end for this unforgettable and special night. For years I've been dreaming of getting a Luka Bloom DVD, and now this dream will come true very soon... and maybe the fact that we were so lucky to be at the recorded show ourselves, knowing about the incredible fascination and magic of the night, will make it all a bit more special! Can't wait!! Saskia, Adeline, William and Colm for contributing their wonderful concert reviews! they will keep our own memories fresh until we get the DVD!